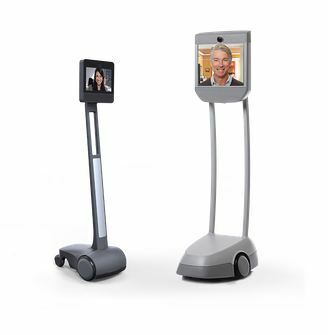 I started seeing robotic video conferencing devices appear around 2010. I wrote a few blogs on the HeadThere Giraffe, AnyBots, and VGo (see my blog entries here) and even watched an episode of “The Big Bang Theory” which featured Sheldon using a “nice virtual presence device” to meet the Woz. Despite the fast early start for these new products, and not atypical in the video conferencing industry, I did not see or hear much about this technology after that. Sufficiently intrigued, I went to the Beam web site to find out a bit more. The web site is a bit, hmmmmm, lacking in technical detail, but, it appears as though you need an app on a computer (mobile device?) connected to the Internet, some unspecified relays, and, at the remote end where the Beam smart presence device is located, WiFi (802.11 working at 2.4 GHz or 5.0 GHz). It appears to be able to work over 4G as well. Note: They have videos on set-up and such but they are “unlisted” on YouTube and give me a warning about sharing….wtf. Technical details aside, the Beam appears to be pretty cool. They have a bunch of videos on the web site showing how the Beam is being used in various scenarios. From those videos I picked two that might be of interest. Education: (Bringing in remotely located experts to talk to students….we did that in 1990…see our Personal Telepresence concept). Beam Store: This is super cool! A store where the salespeople are present only via the telepresence device. IEEE did the video and interview. Ever since I first saw this technology, I thought there were a great number of applications for a robotic virtual presence device,particularly in education. As with most groundbreaking technology, it just has taken a few years to see those applications become reality.